One of the hardest parts of teaching nonfiction is the constant scrounging for text. Finding text with the right level, the right topic, the right text features--it takes time and effort. For the past few years, I've been working on creating sets of texts for teachers to use. I do have a set of "Text Structure Resources" that I send to teachers at their request. Over the summer, I posted Cause and Effect Texts and Activities, followed by Compare and Contrast and Problem and Solution. All of these files include multiple texts that show the text structure, along with activities and teaching tips. The goal is to minimize the effort of scrounging for text. But why no chronological order? Even though this is the text structure that I usually start with for teaching text structure, it's taken me time to put together resources for it. Part of the reason is that chronological order can take so many different forms. Procedural text, animal life cycle texts, biographies, historical accounts--all of them are organized in chronological order. If I was to put together a set of chronological texts, I'd have to include examples of all of these. This was a daunting task! This fall, I started to write. And write. And write. I started out with "Whoopie Wars". 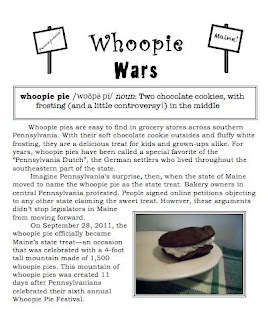 When I began the research, I firmly believed that the whoopie pie was a Pennsylvania Dutch treat. I even looked in the old Pennsylvania Dutch cookbooks myself (what a wealth of knowledge is available from Google Books! ), hoping to find something that others had missed. 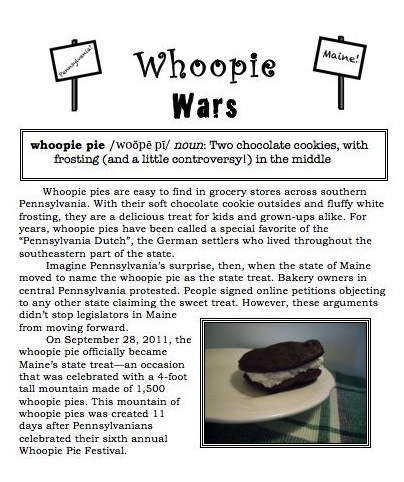 Alas, no documentation for whoopie pies in Pennsylvania--but a good story. I needed to do some firsthand research so that I could take photos of whoopie pies, so my husband and I spent a Saturday baking whoopie pies with our sons. Research has never been so delicious. I knew that I would write about monarch butterflies and wood frogs, because I had great photos of both creatures over their lifespans. These articles were easy to write. I look forward to sharing the wood frog article with my students this March, when we bring in some wood frog tadpoles into the classroom. The biographies, however, proved a little harder. I had originally written "Anthony Wayne" when I was doing an in-service presentation for teachers in Waynesboro. I decided to do some deeper research and spent a few weekends reading letters to and from Anthony Wayne. This gave me the confidence I needed to write "Dolley Madison", which was considerably more difficult--especially because many of Dolley's documented recollections from later in her life were found to be questionable. Writing this short piece took hours of research from multiple sources to make sure that I was including only the best information. I couldn't get the readability on Dolley Madison low enough, so I went ahead and finished out the set with "Lafayette", a text which my husband already plans to use with his third graders. The finished product, "Chronological Order Texts for Teaching Text Structure" includes 10 texts, 8 with before, during, and after reading activities and multiple choice questions. It costs three dollars, and hopefully will save you from hours of scrounging for texts. Enjoy, and let me know what you think! This week, I've found two online texts to complement what I'm teaching in the classroom. Compare and contrast: We are currently reading about Antarctica as we explore nonfiction texts. I have the MV FRAM Expedition Blog in my Google Reader, and I share it with students. It is well-written and interesting, and the kids are enjoying tracking the progress of each trip to Antarctica. This post is a nice compare and contrast piece. The picture tells the story, and the text uses parallel structure and longer sentences to explain how the two days were so different. I like having quick little texts to show students as we transition from guided reading to core instruction, or to share during bus time and all of those extra minutes through the day. Cause and Effect: We've been studying ecosystems in science. Last week, we studied how ecosystems change by reading A Place for Butterflies by Melissa Stewart. Then, we played the Project WILD game "Oh Deer!" to look at how a population can change. This is a nice counterpoint to the zoo mystery article from a few months ago. In that article, we had known effects, but questionable causes; in this one, we have a known cause, but anticipated effects. I made a little debriefing sheet to talk about it with my students. Here it is on Slideshare. This week, we've been looking at how ecosystems change. Some of these changes are natural, while others happen because of humans. We talked about how these changes to the ecosystem can impact the animals that live there. 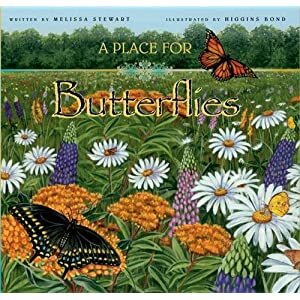 Melissa Stewart's book A Place for Butterflies was a perfect addition to this lesson--and a great way to share the problem/solution text structure. On each page, this book explains a problem that butterflies face, and then shows a way that people have helped to solve this problem. We started by reviewing how ecosystems can change. I showed students the book, and explained that the author explains problems and solutions in the ecosystem. Then students made their own problem and solution charts. I modeled on the chart paper, and then students created their own by folding a sheet of notebook paper. I read aloud the first pages and explained how to find the problem and solution. We worked with the main text at first, skipping over the insets for the time being. While there aren't any traditional problem and solution cue words, the text follows a pattern. The problem is presented on the left hand page, with the solution on the right. As I shared the first few pages, I also showed students that there are more butterflies and caterpillars of each species hidden throughout the illustrations. I have a very artistic class this year, and they loved this little touch. We purchased 7 books over the summer, so students could work in groups of 3-4 to read the rest of the book. Because it's available in paperback, this is a very affordable addition to our science library. Students quickly scattered throughout the room to work in their small groups. They continued reading and finding problems and solutions. Although this text is listed as an easier book, with some recommending it for K-3, my fourth graders found it the perfect challenge. As they worked, I went around the room and listened to them. Many groups had problems with the idea that letting natural wildfires burn could be helpful for butterflies! We had talked about natural and human-caused forest fires. Living where we do, though, they had no experience with beneficial forest fires. Some groups also didn't know what "cattle" were. I coached them to use the supportive illustrations to figure it out. I chose one group to sit next to the easel to continue the chart that I had started. Of course, this was a highly coveted position! These questions helped to frame our discussion after reading. 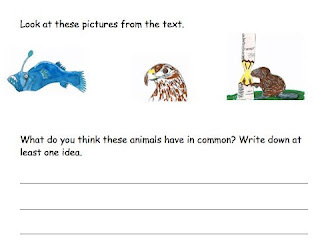 You'll notice that they are a mix of reading questions and science questions. -Why was the text structure of problem and solution a good fit for this book? -Which set of problems and solutions surprised you? Which confirmed what you have learned before? -How did the illustrations add to the text? -Which of the solutions have we tried? Which could we try in our area? I love "The Nutcracker"! When I was in seventh and eighth grades, I even got to perform in a community production as a Snowflake and a Flower. The experience was amazing. Even now I remember the magic of waiting in the wings as I listened to the introduction to "Waltz of the Snowflakes." When my oldest son was just 3, I convinced my husband that we had to go see The Nutcracker. Over the next few years, we went to various local performances. My husband, who had never seen the ballet before, was intrigued by hearing me talk on and on about different Claras and watching for the expressions on the faces of the dancers to see who is jealous of whom and how each production is a little different. He started to enjoy our yearly trips as much as I did. 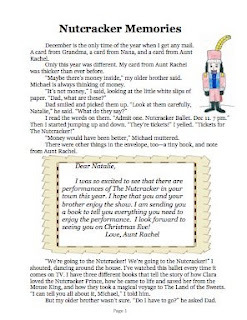 Although he had never seen the ballet as a child, my husband decided to show "The Nutcracker" to his third graders. It's a great holiday activity that builds background knowledge about performances and the theatre. Over the past few years, I've put together some materials for him--a story, activities, and a guidebook. He's added to the magic by creating a real theatre experience in his classroom, right down to giving the students tickets to attend and having a real intermission with refreshments. There are some wonderful DVD versions of the ballet out there. My favorites are the San Francisco Ballet's and the London Royal Ballet. I've posted the items that we put together over on TeachersPayTeachers. It's free for now. I'd love to hear if you try it out and enjoy it! Over the past few years, I've come to a comfortable pattern for planning reading experiences. The pattern is simple--before, during, and after. When I have all of this planned and worked out, my task as a teacher is so much easier. Here is how I frame texts to share with my students. This is a harder list of words from "The Adventures of Isabel"
What will students do before they read the text? I like to make a table with key words from the text. This makes a quick and easy speed drill that we can read together before students encounter the words in the text. I like to read the words aloud to students, and then have them say the word back to me. I change my voice for each word and make it really dramatic, so kids find this enjoyable. As we come back to the text over multiple days, we return to the speed drill each day. (Cute story: We were working on The Adventures of Isabel on Friday. I accidentally called a student by the wrong name, and he looked at me and said, jokingly, "I am really cross with you." I also use this opportunity to talk with kids about the words. This isn't a full-blown vocabulary lesson, but a quick discussion of the words. Sometimes we act them out; sometimes I draw a picture; sometimes I show kids how a derived word relates to a base word. In the case of the word cross, I drew their attention to the fact that it is a multiple meaning word. I've learned that it's best to limit these words to 15-20. I look for words that are important to the content of the text, as well as words that may be difficult for students. Sometimes, these difficult words are short, like "scarce"; sometimes, they are longer words that are related to words they already know, like "professionally". After we look at vocabulary, I ask kids to use the words to make a prediction. This may take different forms. In fiction, I often have kids sort words according to story elements--which words will relate to the characters? The setting? The conflict? In nonfiction, we often write 3 prediction sentences, with at least one of the practiced words in each one. Sometimes we ask questions--for example, in a recent text, kids were intrigued to find out how the word "powerful" would relate to a text about Antarctica. And sometimes we draw pictures, doing a sketch-to-stretch kind of activity. The goal in all of these activities is to equip kids with as much as possible before they enter the text. When I have it all planned and copied for kids, we can all immerse ourselves in our preparations for reading. I project it on the board, kids can make notes and predictions on their own copies, and we work together to get ready to read. Adventures of Isabel: Activities to go along with the classic poem. It's a challenge for kids, but they absolutely love it, and it's a perfect choice for repeated readings. You can find the poem online. Animal Adaptations: Science text and activities suitable for grades 4-5. Decomposers Article and Activity: I loved reading this with kids. It worked so well to change their ideas of what decomposers are. This text includes an anticipation guide, another of my favorite before-reading activities. Good for grades 3-5. The Acorn Mystery: I wrote this based on a real experience! It shows how these ideas can be used with fiction stories for younger readers. Good for grades 2-3. Retelling Nonfiction: This includes a text about how painted turtles survive the winter, with directions for retelling nonfiction. Now that I have two children in school, I realize the importance of homework. For many parents, it's a welcome glimpse into the life of the classroom. When I work on homework with my sons, I can see what they're doing in school. So I am now careful with the homework that I send home. What do I value in spelling instruction? What do I want to be communicated across home and school? My first step, of course, is to make everything predictable and easy to understand. (As a parent, I love predictability!) I put the spelling list on the front page, along with a list of the assignments. Usually I also include a little note about the list, explaining why it is interesting or important. The rest of the homework assignments are stapled in opposite order, so that pages are easy to tear off and turn in. But what do I put on those pages? If you're a classroom teacher, you can probably appreciate the challenge the of coming up with homework for each week. I know that generic assignments are easy. 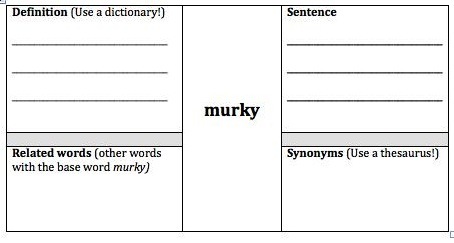 However, since so many of my spelling words are vocabulary words as well, I want to make assignments that are content-rich. Helping kids to learn about words and how they work is something that I value highly. Here are some assignments that I use and recombine for each list. These take some teaching, but they really work well. I have kids do about 2 semantic maps for each list. They are best used judiciously--I would never want to make kids do a semantic map for each word on a list. I look for words that will lead to interesting conversations, and words that have lots of possibilities for adding prefixes and suffixes. 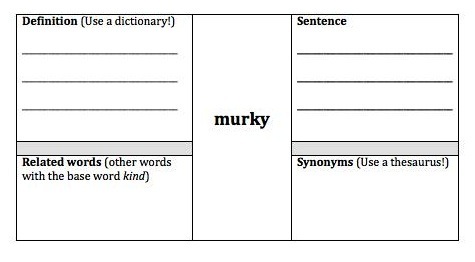 For example, "murky" is not the most common academic word, but it is an interesting adjective, and has many different forms, like murkier, murkiest, murkiness, and so forth. A month later, a few students spontaneously used this word in their descriptive paragraphs. To make a semantic map, simply make a nine cell table in word. Use "merge cells" to combine the middle three cells, and gray out the middle cells on the left and the right. After kids have created their own semantic maps, we make class maps together. It's always interesting to hear how different dictionaries and thesauruses list different words. And it's good for the kids to have a use for the dictionaries they were given in third grade. It's pretty disheartening to see hastily written spelling sentences. At the same time, I don't really want to spend my entire life grading spelling sentences. I've found that the quality of sentences increases when I give kids two words to use. Sometimes, I offer words that fit together well, like "phantom" and "night"; sometimes, I offer words that will nudge kids toward writing more complex sentences, like "fought" and "but". (These were from a list of gh and ph words) When we share our work, it's always fun to see how everyone used the same two words to create very different sentences. These offer the artistic students a chance to shine! I make four panels on the page, and students have to write a comic using a given number of words. No matter what the list, I can always manage to find a few multiple meaning words. These are so important for reading success that I want to give kids a chance to work with them. 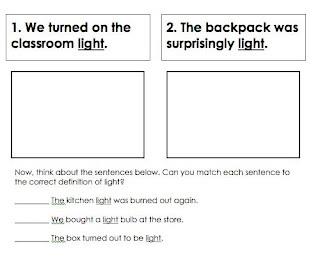 One easy task is to put two definitions in a box, and then have kids decide which definition is shown in each sentence. Another task is to illustrate sentences that show each meaning of the word. Notice the common theme--I like to give kids the definitions, and then have them work with the words in a meaning-based way. Many of our lists focus on what happens to words when we add prefixes and suffixes. In homework assignments, I try to highlight these aspects. Charts are a great way to do this. 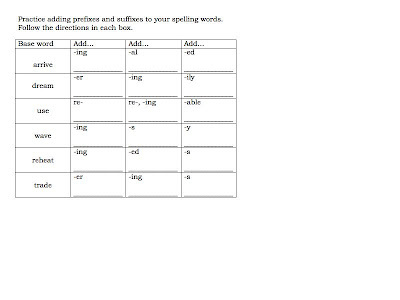 You can give kids the base words and suffixes; they can write the derived words and try to use a few in sentences. You can give kids the derived words; they can write the base words. 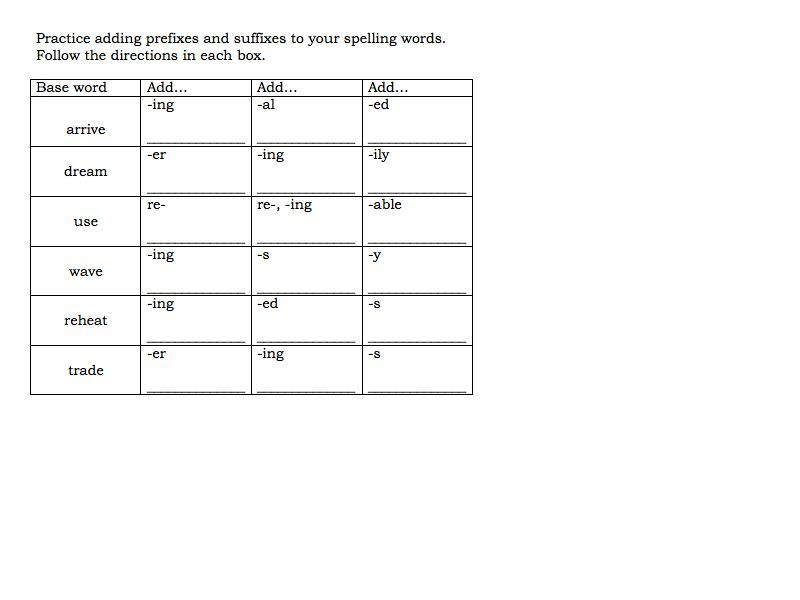 In the chart to the right, students have to decide how to change the spelling of the base word as they add the given suffixes. Practicing cursive has its place. After all, kids need to be able to read cursive. I practice my cursive skills each week when I make a handwriting practice sheet. But handwriting practice doesn't have to be boring! On the page that I gave students today, they had to circle the illegible writing and find the invisible hamster. (Can you tell that we were examining words with the -ible suffix?) On another assignment, they had to copy and illustrate the sentence "Please refrain from raisin mistakes." Lots of funny discussions there--but they helped kids to build their understanding of the use of the word refrain. By mixing these different assignments, I can add some variety to each week's spelling list--without feeling like I'm starting from scratch each week. I haven't published any of the lists in this style, but I can send some your way if you'd like. (I'm doing materials for Syllables and Affixes and Derivational Relations this year.) How has your thinking about spelling homework changed? I love teaching science. Last year, I had the chance to pick it up again after a few years away from it. I had forgotten how much I enjoy talking with kids about their science understandings and planning lessons to help them grow. For the past week, we've been looking at food chains. My students don't have much prior knowledge about food chains and food webs, so I pretty much started from scratch. I created this Powerpoint to introduce the basics. While I was in college, I worked as a camp counselor and naturalist. It was as a naturalist that I first discovered one of my favorite games for teaching about food chains--Into the Forest: A Food Chain Game. Since then, I have used the game multiple times in both formal and informal situations. It never fails! The kids love the beautiful illustrations. They marvel at the lists of what creatures eat others. "I never knew that skunks eat insects" or "What is a shrew, anyway?" The game works just fine with a whole class, with each kid having 2-3 cards. At first, everyone works to get the high order predators. Who doesn't want to be top of the food chain? But then I add the wrinkle of the energy points at the top of each card. While the owls and the bobcats are really awesome, they only have 1 energy point--while the less exciting plants have 10. The game changes for everyone, and we play another round before we talk about what we have learned. It becomes a favorite for indoor recess. No discussion of the food chain is complete without a discussion of decomposers. Last year, I had trouble getting together some simple and quick materials to teach about decomposers. I wrote a short article and created an anticipation guide for it. 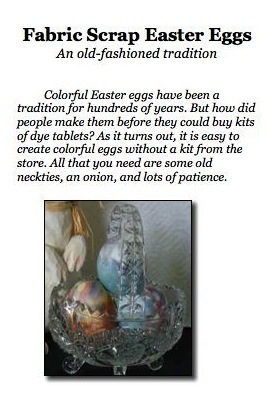 This year, the article and anticipation guide went wonderfully. Kids were surprised to find out that they have indeed seen decomposers--and that decomposers may not be so disgusting after all! And then I finally got around to setting up an account on PBS Learning Media. This was the find of the week! Short videos on various topics are easy to find and favorite, with none of the horrible ads of those other video sites. With one search, I found a 3-minute video on the food chain to reinforce everything that I wanted students to know. Magical! I'm actually sorry that our study of the food chain is coming to an end. But I'm excited, too, because our next unit is adaptations--and that is even more fun. Do you have any great science resources to share? Teaching theme can be a real challenge. When kids have trouble, here are a few tactics that I've used. 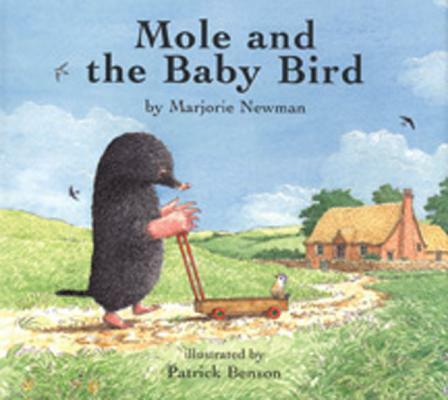 Use lower level texts for teaching theme: This year, I had wonderful success with Mole and the Baby Bird. Now, this is a very easy text. We read it three times before we looked at the the theme. First we watched this wonderful video version. Then we read it again and sequenced the events. By the third reading, I had gotten to that wonderful point where the readers felt secure enough to speak up, offering their own inferences and interpretations. This was the time to bring up theme. When kids only talk about theme in reference to stories that are a bit of a stretch for them, they'll always put theme in that fuzzy part of their brain where they store ideas that don't quite make sense. Using easy stories helps to make theme a little more comprehensible. Raise the level of concern: So one day I earnestly taught about theme. I showed the Powerpoint, discussed examples, shared a story. At the end of the session, I asked students to write down an explanation of theme, or an example of a theme. Not one kid could. This started a serious discussion about what was happening in class versus what was supposed to happen in class. It made an impact, because the kids tuned in to our next conversations about theme. They wanted to learn! They knew that it was important! (They didn't want to hear me lecture again?) Regardless of the reason, things improved. Connect to other media: Kids often know more about theme than they know. Every single episode of Star Wars: The Clone Wars starts with a statement of theme. So many kids have some knowledge of theme and how it is expressed in a story. Not that they realize this, of course. "Oh, you mean that screen they show before the episode starts?" they ask. Yes! Other popular shows have strong themes as well. Tell them a theme: If you're working to have kids try to support a theme, sometimes it helps to give students a theme that goes along with a story, and then have them find reasons to support it. What I love about this is that it often spurs students to come up with a different theme, just to be contrary. If they can support it, that's great! Keep track of themes throughout the year: Make a poster to keep track of themes that you uncover in stories. Enjoy teaching theme! It's a wonderful journey! I love the book Greedy Apostrophe by Jan Carr. In this book, the punctuation marks all take jobs from the Director. But Greedy Apostrophe wreaks havoc in toy stores and magic shops, inserting apostrophes where they don't belong. This book makes talking about apostrophes so easy and fun! Like many elementary students, many of my fourth graders start to put apostrophes everywhere in their writing. Greedy Apostrophe gives us such an easy and concrete way to address this problem--after we read the book, I can just say, "Hm...I see a greedy apostrophe in this paragraph," and kids know what to look for. I created the sheet below to help students apply the ideas in the book as I read it aloud. But the best part of this book is that there is more to it than the grammar rules. Kids like to look at how all of the different punctuation marks have been characterized, and many pick up on the punctuation puns that are scattered throughout the book. Some kids even notice the color scheme--"Why does red always mean angry?" one girl wondered, pointing out the fact that Greedy Apostrophe stands out from the rest of the punctuation marks. Another student drew a picture of Greedy Apostrophe in the Punctuation Pen, with a word bubble: "I've learned my lesson! Only use apostrophes to show ownership!" As fourth grade readers encounter more challenging texts, they need to pay close attention to setting details. 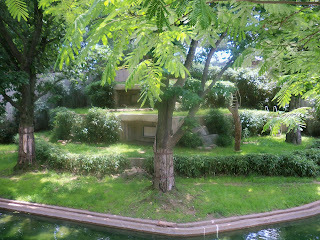 Sometimes, these details will help them to discover the setting, as I wrote about last time. But setting details will also help readers to build background knowledge about places and time periods. This only works if kids are consciously collecting these details, though. Readers who are reading sentence by sentence often just think about the setting in small terms (the bedroom, the playground, the house) instead of taking a broader view. They often don't catch the setting details that build a bigger picture. Over the long run, think about how this impacts their schema and their comprehension! 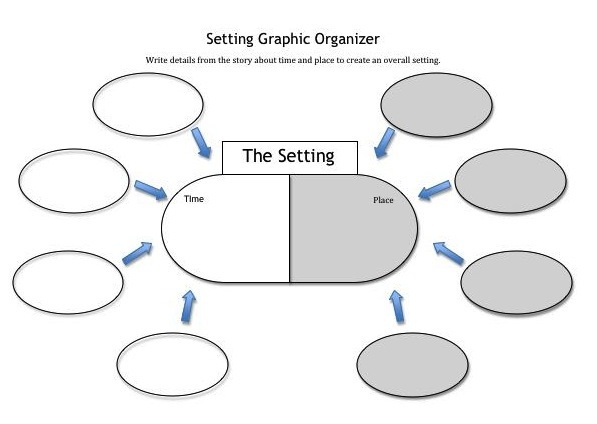 I created this graphic organizer to help kids think about setting and time details. (Well, okay, I sketched it out, and my husband did the formatting!) On one side, students collect details about the time period in which the story is based. On the other side, students collect details about the place. This helps them to pay attention to the details in both the text and the pictures to help them learn more about the time and place. What books work well with this? I started with The Librarian of Basra, available on Tumblebooks. (If your school library doesn't have access, try large public libraries.) We read the book together twice. On the second viewing, we started to add setting details. I told them that the book takes place in 2003, as discussed in this newspaper article. Then we mined the text and the pictures for all of the details we could find about the setting. It led to some interesting discussions--one student said that the houses looked like houses in Mexico; a student who has been to Mexico disagreed. We talked about the palm trees in the pictures, and what they meant; we talked about how the story is deeply connected to the setting. Helping students to go beyond just place-based thinking about setting is an important step. But I can't just relax and work setting...because plot is on the horizon. And understanding plot brings a new set of challenges! Well, we're finally moving on to story elements! This year, I'm trying to work on two thorny setting issues--the issue of multiple locations in one story and the issue of understanding time as a component of setting. 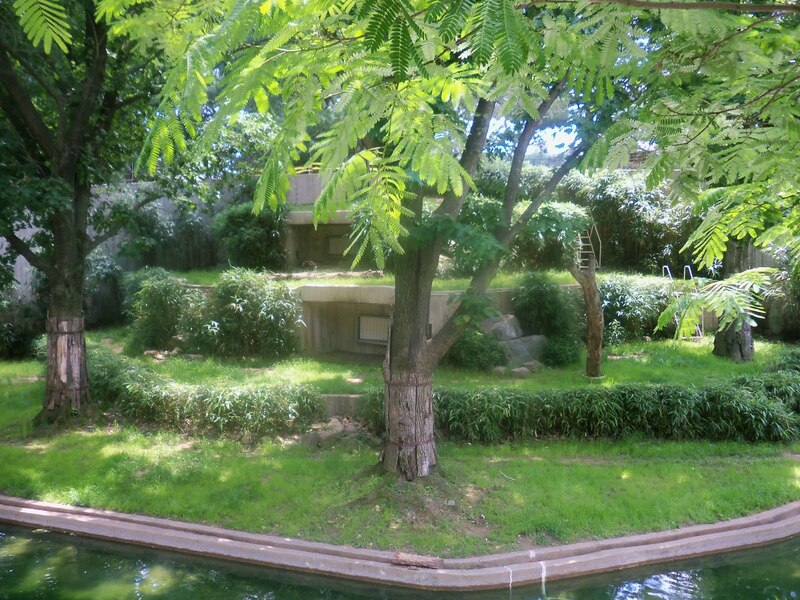 In the primary grades, setting is often described as one location--the barnyard or the house or the playground. As students get older, though, they often have to describe more complex settings. A story might start in one location, and then move. The reader needs to collapse this list of different places into one overall setting. Today, I started by practicing collapsing lists with my students. We started with easy ones: mango, pineapple, orange, apple (fruit); basketball, softball, golf, tennis (sports); table, chair, lamp, sofa (furniture). Then we looked at how this could work with setting: hallway, cafeteria, library, classroom (school). To show students how this works with a text, we read the book Earthquake by Milly Lee. I love this book because it tells the story of the San Francisco earthquake in a very simple, powerful way. And "San Francisco" never appears in the main text! We made a list of the locations shown on different pages: the family's living room, their apartment, the street, Chinatown, Golden Gate Park. Then, we tried to collapse the list. This required them to pull on their background knowledge. (We had read a play about the San Francisco earthquake the week before.) Some groups pulled on this experience, while others used their knowledge of the Golden Gate Bridge. The important thing, however, was that they were able to collapse the list of small locations into one main setting. I love how simple this lesson was, and yet how important. It brings together the idea of collapsing lists with making inferences with story elements. Wonderful! Well, the setting is the time AND place of the story. But many readers are a little too literal with their statement of time. Instead of "1906" as the time for Earthquake, a reader might write, "in the night and the next morning." This is a big problem, because a reader who is thinking of time on such a micro-level may not notice important dates and might fail to add big ideas to their schema. 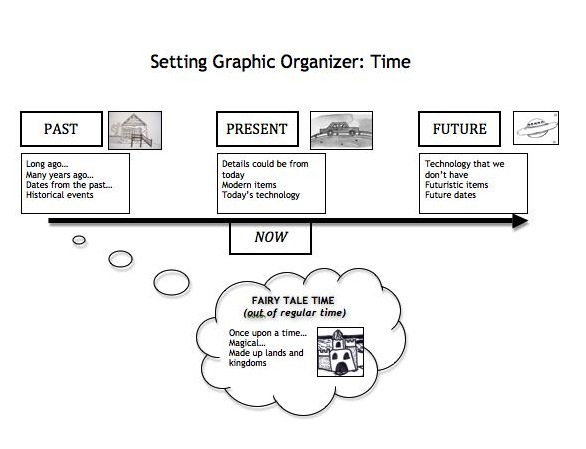 I decided to make a graphic organizer to show a timeline. When I handed it out to students, I didn't explain anything--I just said, "What do you notice?" Working with their partners, they found all of the important elements: that it shows how time goes in one direction, that there are little pictures to show past, present, and future, that it includes words to help you find the time of a text. What about fairy tales? It's so hard to show how they fit in. I decided to show how they are off the timeline. Fairy tales and fantasy take place in another time, often with elements of the past mixed in. After we read Earthquake, we talked about how the setting is not just the location, but also the time. Students easily found that it took place in the past--once again, by drawing on their background knowledge. I love it when things come together in one lesson. And a great book makes it happen even more easily! This neat little book came free with my last Scholastic book order. Now that I have read it approximately 14,000 times to my first grade son, I have come to appreciate how it could be used to teach the text structure of compare and contrast. As I've written before, it's tough to find entire compare and contrast texts in the real world. Usually authors will use this structure in a paragraph or two to highlight similarities and differences. But it's difficult to sustain over a long text. This book, however, uses compare and contrast in a contest format. It works pretty well. Questions set up sections of text, such as "Who's got an ear for everything?" Then, the questions are answered in several paragraphs, which usually show the clustered style of compare and contrast. Compare and contrast cue words such as but, too, both, and also are used on just about every page. I didn't find any use of however, which was probably left out in an attempt to keep the reading level down. And it is a fairly easy read--not easy enough for my first grader to read alone, but definitely comfortable for the reader in grades 2-3. 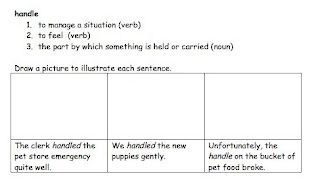 For teaching text structure, I like to introduce the structures with easier texts, so this would be just right for my struggling fourth grade readers. All in all, this is a very economical book to obtain to teach compare and contrast text structure. I'm looking forward to trying it out this year! At the workshop, we looked at how we could re-purpose cheap and free items to make engaging literacy tasks. Cup stacking: This idea came from the Third Grade Thinkers blog. Using transparent cups, we can build words with prefixes, suffixes, and base words. First grade teachers also talked about using these for onset and rime! Advertisements: A certain bulls-eye retailer has sent out haiku coupons this fall. I can't bring myself to use them to get discounts--they're too neat. Haiku and persuasive writing, in one tidy mailer. One teacher suggested cutting them apart for students to try to re-assemble. Any other ideas for doing more with less? Plugging Away with Making Inferences! Just like I wrote about last time, we're working on making inferences in reading class. It continues to be a challenge for my students, but they are so enthusiastic and upbeat that it is a joy to work with them. To help students see how they make inferences all the time, I showed this commercial favorite. We talked about what was happening in the commercial. How could they tell? What clues could they use? This really got the boys in the class thinking and talking--they were so excited to share their background knowledge! This story presents embedded questions for students, so that they have to make inferences all through the story. I wrote this presentation to show students how important it is for them to activate their schema before they read, so that they can make inferences quickly and easily. This includes stories and activities to use to help students make inferences about character traits and emotions. Doing the research for this book helped me to understand how important it is for students to pay attention to small details so that they can make inferences. As I looked ahead at the story elements unit, I realized that I had to do some work on making inferences. After all, telling kids to make inferences about the setting of a story won't make much sense if students don't know how to infer! But where to begin? With this group of readers, I want some quick success to build their confidence. 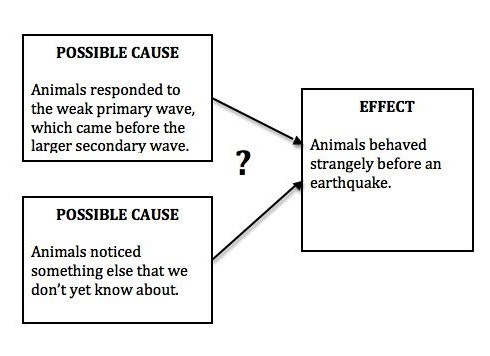 I decided to start with text-based inferences, taught along with some visualizing. As I wrote about in The Forest and the Trees, text-based inferences are those that depend on a knowledge of how text works. Finding the speaker in dialogue, matching pronouns with antecedents, and using specific clues from a text are all examples of text-based inferences. Visualizing, on the other hand, is a form of reader-based inference, which depends on a reader's background knowledge. Why is visualizing a form of inference? No author ever tells every detail about a passage. Instead, a reader needs to bring some background knowledge to the text in order to form a visual image. As I researched The Forest and the Trees, I came across an interesting journal article. This article, authored by Philip Winne, Lorraine Graham, and Leone Prock, explains how struggling readers learned to make text-based inferences with the help of some carefully written texts and immediate feedback. The study is on the older side (1993), but I couldn't help but see how the methods described could help my students. Readers don't need a whole lot of background knowledge to make these inferences. And the process forces them to look closely at the details in the text to explain how they make their inferences. Great stuff for my students! The texts that I wrote (on a sunny Saturday, when I should have been doing math plans) set readers up to make text-based inferences. A rule is presented early in the text. Then, the character is faced with choices, along with a good deal of distracting information and a hidden critical fact. The reader needs to match the rule with the critical fact to make an inference. I plan to teach Mission #1 on the whiteboard, showing students how to make the inference using the rule and the critical fact from the text. Then, they'll work on Missions 2 and 3 with a partner, with a lot of supervision. Finally, they'll work on Mission 4 on their own. This kind of inferencing is a great first step for transitional readers. Once students get good at finding these text-based inferences, they'll be ready for the next step into more open, reader-based inferences. And--hopefully--ready to have some brilliant discussions about finding the setting in a story! If you try these mission files with your class, I'd love to hear how they work! As I was planning for this week, I realized that I need to change my approach with multiple meaning words. In the past, I've looked at teaching multiple meaning words as teaching kids how to use the context of a text to figure out which meaning of a word is being used. In this way of teaching, I've assumed that the kids know the multiple meanings--what I'm teaching them is how to tell them apart. The idea is that I'll take a multiple meaning word that has an easy-to-visualize core meaning--for an easy example, run. The core meaning of run is to move quickly over the ground. Students will write this meaning and illustrate it. Then, I'll introduce 3 other meanings: run as in to compete in an election, run as in to flow over the ground, and run as in the name for a stream. 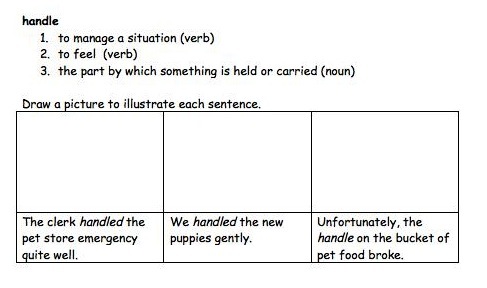 Students will write sentences to show these different meanings. If you're planning to try this with your students, make sure that you choose multiple meaning words that come from a common source. For example, the meanings of revolution are all related. However, the meanings of wind/wind are not. If you use an online dictionary, you can find the etymology to see if the different meanings come from the same source. We'll see how it works! I'm looking forward to helping students to see how different meanings of words can be related. But confusions remain. I've realized that this is because understanding multiple meaning words goes deeper than just matching definitions. In fact, I'm beginning to realize that this problem with multiple meaning words is linked to why my readers are struggling in the first place. Multiple meaning words look the same, but have different meanings. Sometimes this occurs when 2 words enter the language from different paths. For example, the bat used in baseball comes from the Middle English bateren, which meant to hit. The word for the flying mammal bat, however, came from Scandinavia. These two words look the same, but have completely different meanings. Knowing one won't help you figure out the other. Polysemous words, on the other hand, share a common core meaning. Take the word spring. Its core sense is an old, old word meaning "to leap". The other meanings of spring all relate to this core meaning--the season spring, the water spring, even the coiled piece of metal. Knowing one helps you to know them all. 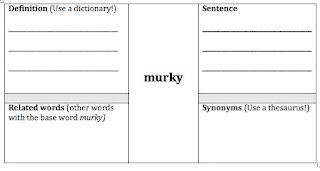 When I ask students to do common tasks with multiple meaning words--match the way that a word is used in one sentence to another sentence, for example--they often resort to guessing. What's going on? For one thing, these activities often happen outside of a connected text. Readers who are used to sucking up information from pictures or previous pages have little to pull from. So these activities bring out a very real problem that these readers have with creating visual images. When I changed my instruction to have students draw a picture of each sentence before they tried to do the matching task, I saw a huge improvement. The simple step of adding boxes spurred readers to visualize, which helped them to see how the words showed different meanings. Readers who are spontaneously visualizing probably don't need this step. However, this experience showed me that my readers are not spontaneously visualizing--definitely a useful piece of information! The problems with multiple meaning words only served to highlight a deeper reading issue. An interesting journal article by Marjolijn Verspoor and Wander Lowie found that L2 learners do better when they are taught the core meanings of words. One of the examples in the article is the word nugget. The core meaning is the kind of nugget as in a gold nugget. An understanding of this meaning helps a reader to understand the figurative uses of nugget as in a chicken nugget or a nugget of information. Since I have many ELL students in my reading class, I found this very interesting. Now, I try to help students see how the core sense of a word relates to the other uses. How do the different meanings of wild relate? What about the multiple meanings of shop? Often, these students have trouble with the uses of a word that are within one part of speech, such as the meanings of bold. It's a process! Hopefully, helping readers to visualize sentences and build their awareness of core senses of words will help them to better understand multiple meaning words. Here's a funny story about Aidan and multiple meaning words. My youngest son, a first grader, loves big cats. I'm embarrassed to admit that, three years ago, I would have had trouble distinguishing a picture of a leopard from a picture of a cheetah. Well, no longer. After a year of watching Big Cat Diary every morning and reading book after book about big cats, I can now easily rattle off the differences between leopards and cheetahs. Of course, I can't just read the books. I'm always looking for good examples of text structures! When I found Face to Face With Cheetahs, I knew that this book would be perfect to add to my classroom library. Like Face to Face With Lions, this book starts with a personal narrative. Each successive chapter shows a different text structure. "Fast Cats" shows the causes and effects of how a cheetah's body is built for speed--and how these features can have drawbacks. "Racing for Survival" shows the problems that cheetahs face, and how some scientists are working on solutions. While the book has many text features, it isn't as busy as other nonfiction books. Best of all, the text is quite cohesive and hangs together well. I could see taking paragraphs out of the text to look at in more detail; working with different chapters to talk about how the different text structures can work together; or exploring how the text features add to the information in the text. 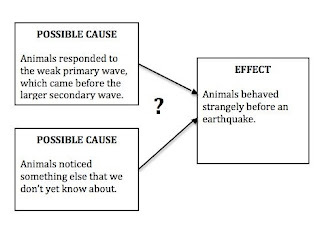 Cause and Effect Activity and Texts: Short texts and activities for looking at the cause and effect text structure. Problem and Solution Texts for Teaching Text Structure: Short texts with the problem/solution text structure. 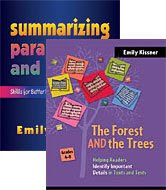 Compare and Contrast Texts for Teaching Text Structure: More short texts! These have the compare/contrast structure, the most difficult to find in whole texts. This story happened two years ago, and it still makes me smile. I've kept the poster with all of the summaries and the pictures that students made. Definitely one of the best lessons that I've learned! On a related note: We haven't seen many woolly bear caterpillars this year. Lots of buckeyes, but no woolly bears? Has anyone else noticed this? I just love this word. It says that what one might think just isn't true. It prepares the reader for a sentence to come, a sentence that might not match what you are expecting. For my fourth graders, though, this word is one that they often skip. They haven't read much academic text, and they don't have a sense of the power of the word "however." They can miss a great deal of missing for want of a simple word. We are supposed to have music today. However, instead of music, we'll have PE. -My little sister looks cute. However, she bites and kicks. -Everyone says my cousin is adorable. However, he can be mean sometimes. -My little brother looks quiet. However, he can wreck my room in five minutes. We all practiced saying however together, and pausing for the comma. Our next step will be to see how "however" works its way into student writing. 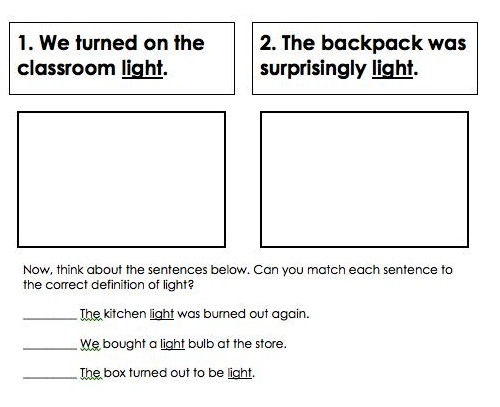 Often, students make some small mistakes as they try to write with it--using it in run-on sentences, using it for situations where it doesn't fit. However, with time and continued practice, this word will work its way into their writing and their reading. Even though the general tone in my reading class has settled into quiet reading, there are still problems that I need to deal with. My time is limited, so I have to triage. Right now, there are three main sets of readers that I am looking at: the quiet readers, the information book readers, and the "flitters". In every class, there are some students who just seem to love reading. They have their books every day, sit quietly, and never misbehave during independent reading time. So, what's the problem? There are some of these readers who are not building a cohesive mental model of the text. That is, they read a page, and may understand some parts, but they are not really understanding the narrative from beginning to end. A book like Dragon Slippers is one that these readers are often drawn toward. There are entertaining bits on each page...but a struggling reader might not be able to put these entertaining bits together into a whole story. These readers do not announce themselves. In fact, they are sometimes hard to spot. After all, they love books! But I need to find them and work with them. In order to do this, I try to check in with 3-4 of the quiet readers each day. These are brief, chatty talks in which we talk about the book. Over the course of several days, I can usually figure out if the readers are building a big picture of the book, or just going image to image. Then, on the next library day, I try to make sure that we browse together to find a book that has a nice, easy to understand storyline. Kids who are drawn to complex fantasy books that they can't yet totally understand will often enjoy reading The Secrets of Droon or The Spiderwick Chronicles. Both of these have a single storyline that readers can easily comprehend. I have several students who lug around books filled with information. I've talked with them, and I'm satisfied that they are doing a decent job of understanding one paragraph at a time. But I want to get them to be able to find success in a chapter book. As fourth graders, they need to be able to follow a story over multiple pages. These readers often need a lot of support. Today, I sat down and read the first chapter of a Horrible Harry book with a student who said that he didn't like chapter books. I read a paragraph, he read a paragraph. Then we talked about what happened. I glanced ahead a few pages and gave him a goal for reading. "In the next part of the chapter, you're going to learn about stub people. I want you to find out who the stub people are." Because he's not quite at the stage of finding a whole story interesting, I had to give him a tangible goal to get him through the next two pages. While he read, I did two quick check-ins, and then came back. "Who are the stub people?" I asked. We talked about it. It was the end of reading time then, and time to get on with the lesson, so I told him, "Let's keep that book in a safe place. Next time, we'll read together again." Keeping these kids engaged in a book requires a lot of close interaction. They're used to a new topic on every page, and the slowly unfolding nature of a narrative seems dull to them at first. I like the Horrible Harry series a great deal for these students, because it is so funny and easy to understand. Dan Gutman's My Weird School series also works well for these reluctant readers. Flit, flit, flit. Every time I turn my head, it seems that these readers are up. "I finished this book," or, "I didn't like it," or "It was boring." These readers require a different approach. Unlike the information book readers, they haven't yet shown much engagement in any text. So I like to use picture books to help them. Last time, I wrote about how much my students enjoyed the Diary of a Worm books. But I have to be careful with the picture books. On the one hand, picture books are great, with their interesting plots and lush artwork. On the other hand, I want kids to choose picture books, not just read them because they don't know how to read other books. So I push kids toward deeper picture books, like fairy tale retellings and historical fiction. I happened to pick up Anansi's Party Time on sale last year, and it's been making the rounds in my classroom this fall. This is a fairly easy text, but as a trickster tale it can become a good background knowledge book for kids. Later in the year, when we talk about genre, I can pull this off the shelf and kids can say, "I've read that!" I also like to keep a good selection of books that are similar in topic or plot. For example, I've acquired three different versions of The Twelve Dancing Princesses. Reluctant readers often like to read each version and then talk to me about which they liked best and why. Independent reading time is always a challenge. But I love being able to use this 15 minutes every day to help students discover the world of books. By thinking carefully about my readers, I can make sure that this time is used well. I think that providing time for independent reading is one of the most important things that a classroom teacher can do. This is time for students to learn about new genres, time for them to apply the strategies they learn in the classroom, time for them to develop background knowledge on a variety of topics. I've learned that I need to embrace the chaos in the first few weeks, and to work tirelessly to get everything settled. Here is how the first three weeks usually end up. At the start, as I'm watching kids, I let them choose any books from the shelves. I have a good collection of the fun pop-up books, including Pirateology and Egyptology, that even reluctant readers like to peruse. I also have almanacs, guides to superhero toys like Bionicle, and world record books. While kids select these books, I watch their choices and take note of what they like to read. I also spend this time at the bookshelves trying to match kids to books. In the second week, I start to encourage kids to move away from the glitzy fun books and into books that have more substance. The pop-up books get put aside for use during homeroom and bus time. Books like Diary of a Worm are immeasurably helpful during this time. Diary of a Worm is very appealing to reluctant fourth grade readers, yet still has a connected storyline. Diary of a Fly and Diary of a Spider are also very popular. I like to gather books that I think will be good matches to the class and put them in a crate at the front of the room. This helps to spread out the browsers, as well as steer kids toward good books. I also keep small boxes of the books that are popular with beginning of the year fourth graders, like Magic Treehouse, Horrible Harry, and A-Z Mysteries. This is the time to tread very lightly, however. There are some kids who feel that they cannot read, and will do anything to keep this a secret--from me and from the rest of the class. These kids are often flitting back and forth to the basket where I keep my high-interest books. Sometimes they just pick up a book and look at the pictures. These kids need more support to make independent reading beneficial. Week 3: Formal recordkeeping begins! By Week 3, the classroom has settled enough so that I no longer have to be on my feet during the entire independent reading time. I use this time to start writing down what I notice and spending longer periods of time per kid. I have a page for each student in a binder, and I write down very quick notes about what I see and what we talk about. On the other side of the room, I listened to a student read parts of Fudge-A-Mania aloud, taking a quick Running Record on the page that I have for her in my binder and talking with her about what was happening. Next to her, I helped another student find a book similar to Owen and Mzee, as we talked about why she liked animal nonfiction so much. In this week I noticed that there were several students who were still flitting from book to book. I decided to address this during guided reading time. With my group of 10 kids (I know--10 is a huge guided reading group! Don't get me started), I started reading Moongobble and Me, a very engaging, supportive chapter book. I like this book because it has a page with pictures of every character, but still gives a bit of challenge. Working together, I'm trying to show students how a chapter book unfolds slowly, and how a reader needs to put the pieces together throughout the text to make meaning from the book. Next week is our fourth week. I'm hoping that it will bring even more contentment to our independent reading time. I'm going to try to move the Diary of a Worm contingent to some longer, more connected texts, as well as check in with some of the students who have been reading their own books from the start. One thing that I've learned is that every group of students is different, and every year unfolds in a different way. But I do know that sticking with time for independent reading yields great rewards. Well, this September has not been so hot as 2009--although we could have done with less rain! Even though it's been relatively cool, choosing read-alouds for September is always an important task. I want to choose books that are engaging, books that are quick to show their gifts of enjoyment and pleasure. This isn't the time for the subtle and slow books. I have about 15 books behind my desk, all great candidates...but when it comes for the actual read aloud, I think and re-think about my choices. Here are the ones that worked out wonderfully! I chose this book to use for modeling thinking about text. The opening section is a gripping personal narrative about an encounter with lions. (I admit that I left out the "mating lions" part as I read it aloud. It worked fine without it.) It was a great choice for this purpose. The text is exciting nonfiction, and it gave us many opportunities for questioning, predicting, and connecting. I also had the opportunity to talk with my reluctant readers about thinking about what's in the text, instead of just looking at the pictures. Get this if you can! It's not currently available to buy new, but it's probably at a local library. I used this one to help students to understand the rubric for the trait of ideas. One of the characteristics of a 6 on the rubric is that the piece of writing helps you think about things in a new way, and goes beyond "common knowledge". Well, the idea of common knowledge is tough for fourth graders. This book was a great tool to use. We talked about babies and what they already know. Then we read this book, which is written from the perspective of an alien professor. Even though we knew a great deal about babies ("I know way too much, especially about diapers," moaned one fourth grader), the details in this book were still fresh and interesting. Well, that was tiring. Three days down, a whole bunch more to go! We had fun going on a world tour (remember, my tables are continents) and learning how to track hurricanes. I consciously tried to make those first few days content-rich, with lots of detailed pictures and real-time data. Each day at 11 am we've enjoyed looking at the updated information from the Hurricane Tracker. I've been trying to get everything situated for the new year. This weekend, I've found some items that I started working on last year, formatted and tweaked them, and posted them to share. I'm also teaching social studies for the first time...how exciting!